Ed Cross|! !| owner of Ed’s Flooring America|! !| is a member of the Flooring America co-op|! !| under the CCA Global Partners umbrella. A mother picking up milk at Vista Foods probably didn’t think she was contributing to the co-operative economy, but she was — the Associated Grocers of New England, Inc., is a co-op based in Pembroke, with a half-billion dollars in revenue. Neither did her husband when he stopped in Gilford at True Value Hardware to get replacement screws to fix the screen door. True Value is also a co-op, based in Illinois, with $1.5 billion in revenue. And when the whole family trekked to Ed’s Flooring America in Hooksett to pick out linoleum for the kitchen floor? You guessed it. 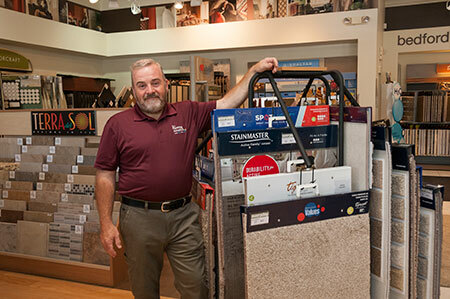 Flooring America is another co-op — part of a group of about 14 affiliated co-ops under the CCA Global Partners umbrella, based in Manchester, with revenues of $10.6 billion. When people think of co-ops these days, they may think of a local food co-op, like the one in Hanover, or they might think of a credit union, like St. Mary’s Bank, or they might think of one of the 123 manufactured-housing co-ops that dot the state. But co-ops are not just made up of individuals. Some of the largest — like the three examples above — are made up of businesses. Businesses may join the co-op because they believe in its principals, with noble words like “democracy,” “volunteerism,” “equality,” “community” and “working together.” But they also like the economic clout and services a larger group can bring, whether it be bulk purchasing or developing sophisticated software, while maintaining some degree of power over their organization. “It helps the small guy be like the Fortune 500 people,” said Ed Cross, the owner of Ed’s Flooring. There are farmer co-ops. There are fishermen co-ops. There are bike co-ops. There are carpet store co-ops. There are day care co-ops. There is even a worker-owned architect co-op. No one is really sure of how many co-ops there are in the state and what economic clout they have. The U.S. Census stopped keeping track of them 20 years ago, and while the National Co-operative Business Association is trying to change that, it is probably not on this administration’s top priority list. Indeed, the Trump budget proposed cutting Rural Co-operative Development Grants, which provide $26.5 million in technical assistance to co-ops, down to zero. The best we have to go on is projected data from a 10-year-old survey by the Center for Co-operatives at the University of Wisconsin, which said that some 200 co-operatives in New Hampshire with nearly a half-million members took in revenues of $640 million and had assets of $3.8 billion. Ed Cross, owner of Ed’s Flooring, stands with Business Manager Vylett Cross and Operations Manager Jacob Cross in the Hooksett store. The center is in the process of conducting another survey of the 30,000 co-ops nationwide, but even if it is updated, and is accurate, what does that mean? The $10.6 billion sales of all the member stores of CCA Global Partners mostly come from stores that are out of state. True Value and Ace Hardware (another co-operative) have between them 45 stores in the state, but they are both based in Illinois. 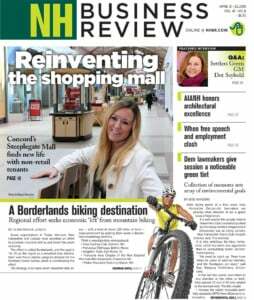 The 130 New Hampshire supermarkets, superettes and convenience stores that are members and affiliates of the Associated Grocers of New England sold about $100 million of goods, about a fifth of national total membership revenue. But its largest Granite State member is Hanover Co-op, which consists of three grocery stores — a store in Vermont and a convenience store and a gas station in New Hampshire — that account for $72 million, though not all of those sales are from Associated Grocers of New England. How do you count all of that? Whatever the numbers, one thing is clear, New Hampshire seems to be an “interesting pioneer” when it comes to the co-op world, according to Lynda Brushett, senior partner with the Co-operative Development Institute, based in Massachusetts, though Brushett works out of her New Hampshire office. Co-ops date back to the first mutual fire insurance company founded by Benjamin Franklin in 1752. Most of the co-ops in the 18th and early 19th centuries were primarily agricultural and were strongest in the populist Midwest. That was true also with the electrical co-ops, developed as part of the New Deal in the 1930s. With its 84,000 customer-owners, New Hampshire Electrical Co-operative might be one of the largest in the state when it comes to sheer membership, but it is the only co-operative utility in the Granite State. • St. Mary’s Bank, which opened in 1908, was the first credit union in the country, and with 100,000 members, is one of the largest in the state. • Hanover Co-op, which opened in 1936, is the first of its kind and the second largest in the U.S., with some 20,000 members. • New Hampshire Community Loan Fund in Concord started organizing manufacturing home developments into co-ops in the 1980s and was so successful it spawned ROC USA, which now has 206 co-ops spanning 21 states, with a total of nearly 13,000 members and more than half of them in the Granite State. • CCA Global Partners, which started as a carpet co-op in 1985 in Manchester, expanded into 14 different co-ops, becoming the first buyers co-op across a variety of different industries. It now includes some 4,000 stores, and in terms of revenue may be one of the largest co-operatives in the nation. There are four food co-ops in the state with close to 50,000 member-owners and nearly $100 million in revenue. Hanover Co-op may have started in the 1930s, but most food co-ops blossomed during the ‘70s to fill a demand for organic produce. Nowadays, they face increasing competition from Whole Foods, Trader Joes and the organic section at grocery stores. Still, revenues continue to increase, as co-ops adapt. Hanover made a $5.3 million upgrade to allow it to offer more fresh produce and off-site prepared foods including seafood and smoked meat, as well as café seating. Hanover faced a shake-up back in 2014, when the previous management dismissed an employee for allegedly talking about a union. But the worker was reinstated and the board was replaced. The controversy “shows that democracy and transparency works,” said Donald Kreis, Consumer Advocate and former Hanover president who rejoined the board after the controversy. Littleton residents invited the co-op to open a store there in 2006, but the co-op declined. Before becoming the Littleton Co-op general manger, Ed King worked as a manager at the local Shaws for nine years. “I was sick of the corporate world,” he said. Littleton underwent a $3.8 million expansion to allow for a café and an area for prepared foods, which eventually resulted in a 20 percent increase in sales. Both Hanover and Littleton carry organic and non-organic produce. Concord Food Co-op, however, remains strictly organic, said Greg Lessard, director of development at Concord. It too went though a major expansion five years ago, resulting in a new sit-down café. It also replaced its general manager with a manager from Shaws, after complaints from staff. Concord’s big initiative is online shopping, developed before Amazon bought Whole Foods. Members can order online and pick it up without having to shop. The co-op hosts a number of activities for members to interact. Community-supported agriculture aren’t necessarily co-ops. A CSA farmer or farms sell shares of its produce to customers, to be picked up at a particular location. But the Concord CSA is a co-op, which started in 2001. The Concord CSA “is not a huge percentage of our production, but a pretty good chunk,” said Robert Noonan at Middle Branch Farm in New Boston, one of the co-op’s eight members. Similarly, Fresh Start Farms consists of two co-ops: the New American Farmers Co-operative, started last year by nine Somali-Bantu, Congolese and Bhutanese refugee farmers in Dunbarton, and Umoja Farmers, started by 11 Congolese, Burundi and Rwandan farmers. Then there is also the Four Corners Co-operative, or the Temple-Wilton Community Farm, which started as a farmer co-operative, but in June of 2016 opened up membership to its CSA customers. There are also two co-ops when it comes to seafood. The Yankee Fisherman’s Co-operative, which sells its catch at a Seabrook store, and New Hampshire Community Seafood, a co-op of commercial fishermen that operates like a CSA, market to both individuals and restaurants. ROC USA in Concord has over 200 communities nationwide and 13,000 members, though New Hampshire makes up a good chunk, with 123 communities and 7,000 members. Nationally, the organization was bought for almost $229 million. Roland Shattuck, a 70-year-old retired electric technician, didn’t think he was qualified to be president of Lakeside Co-operative, a manufactured-home park of 51 homes. But the owner by state law had to give the residents the right of refusal, and, after several meetings, those residents decided that the uncertainty of running a co-op was preferable to the certainty that rents would rise under new ownership. They bought it at the end of June. “Everything seems to be an emergency,” Shattuck said, from figuring out who was the “financial genius” to be treasurer to how to upgrade the septic system. “It’s badly affecting my golf game, and that ain’t good,” Shattuck laughed. The 299-member Medvil Co-operative in Goffstown had a similar rocky start back in 2006, recalled Kimber Capen, the co-op’s former president. Capen, who once ran 28 Burger Kings, had management experience. Medvil only raised rents $10 over the last seven years, he said. Such success stories lead The Community Loan Fund to spin off ROC (Resident-owned Communities) USA run out of a separate Concord office, which created nine regional non-profits, including ROC NH (the largest), followed by Massachusetts, with good numbers in Minnesota, Wisconsin and Oregon. A co-op bank fills in some of the funding gaps, but most of the money comes from former co-ops paying back their loans. Not one has defaulted yet, said Mike Bullard, ROC spokesman, as manufactured-home co-ops become more widely accepted. Jonathan Halle faced a dilemma in 2008 when his partner at Warrenstreet Architects Inc., retired. Buy him out and go into debt doing it or give the company to his employees, and let it continue, with him being just one member-owner? Halle chose the latter, making Warrenstreet one of the few — if the only — worker-owned co-ops in the state. New Hampshire doesn’t have many worker-owned co-ops because it doesn’t have a law for them, unlike Massachusetts and Vermont. They have to be officially corporations or limited liability companies, with bylaws that make them a co-op. Worker cooperatives are different than ESOPs (employee stock ownership plans). While both are often retirement strategies, ESOPs are not necessarily democratic. In addition, ESOPs are so complex they are usually undertaken only by larger corporations. Most of the dozen employees at Warrenstreet are not owners…yet. To be a member there, you have to either have worked in your position in the industry for seven years or work at Warrenstreet for at least three. Revenue goes into three buckets: salary, performance bonuses and profits, which are split among the co-op members. “There is a large financial benefit to being a member,” Halle said.